New Cairo is an underground city inside a giant crater, surrounded, like a crown, by waytowers / elevator exits & structural supports for the roof hanging over the city. The roof of the city is covered in solar panels; an artificial sun lights the inside. Inside the city, many people are effectively cyborgs, augmented with artificial limbs and organs. Unrest is stirring: an affliction has been shutting down the augmentations, leaving people disabled, and even dead. A curfew has been put in place. People from the areas where the infection is common are not allowed to leave the city, supposedly to keep the outside world safe. But it does not seem like a coincidence that those are also the poorer areas of the city - augmentations being pivotal to hard physical labour and industrial work. The rich, meanwhile, are not so restricted. 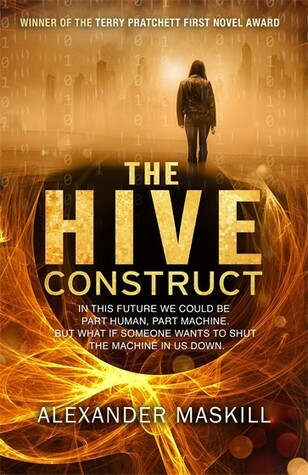 The Hive Construct won the 2013 Terry Pratchett Prize (for first novels). Despite the patron of this prize, this is not a comedy novel (nor a prize for humorous works). It's a thriller set in a future of CCTV-ridden, highly networked cities, full of bio-augmentations and contact lenses that work much like Google Glasses. In terms of technology, there is nothing in the book that seems inconceivable - and nothing you haven't encountered before in other science fiction. But the story isn't really interested in technology: it's interested in the politics and mechanisms of resistance and uprising. The main characters are a computer hacker with a past, a city councillor who is part of a dynasty of super-wealthy businessmen politicians, and a mother who just lost her husband (a revolutionary) and who wishes to escape the city with her children. They all have different problems at the start: one wants to find and solve the virus problem, the second has been kidnapped, and the third finds herself drawn into directing operations due to her experience of running police ops from her computer, while waiting for a people smuggling opportunity to arise. The Hive Construct has several admirable qualities: it never gets boring, it builds up some degree of credibility in its characters and their actions, and everyone has their own problems to deal with. No one is a square-jawed selfless hero, and no one is an evil villain. Set against that is a series of flaws. While the setting may be called New Cairo, it does not feel authentically Egyptian. Where Ian MacDonald creates immersive futures set in emerging nations, this novel just picks up a few vaguely Egyptian-sounding character names, but could otherwise be just as easily set in America or Britain. And while the characters seem more or less believable (if not particularly Egyptian), the story still treats the wider population - crowds especially - as a malleable mass, easily manipulated, directed, a liquid flow, rather than anything feeling realistically like people. This gives the book a strangely detached feel, especially in the later chapters. These come across like a strategy game or a Roland Emmerich movie: lots of action, but not much punch. In the end, it's a novel experimenting around with politics. Inspired by the Arab Spring, the Occupy Movement, the London Riots, and every other recent instance of unrest and the wider problem of economic disparity, it's really a novel wondering about the rich and the poor, about politicians and corporations, about ends justifying means and how the means might affect the ends. It's a thought experiment, dressed as a scifi thriller. It's not stupid, but, like other novels which toy around with such themes, it feels a bit too calculated, a bit too concerned with its points to really connect. It's like reading China Mieville's more political novels (e.g. Iron Council), but without the linguistic distractions. As thrillers go, it's not bad, and on a par with Michael Crighton's work. I had hoped for something a bit more ambitious, though.